In order to see what students already know about the financial aid terms, I give them a unique version of a KWL type chart and a WORDLE of their terms. Students must sort them according to the headings. Most students have no clue what the majority of terms mean initially, but they will learn them. Part of their assessment is a vocabulary quiz on the terms, which they can study and then quiz directly on the Quizlet website. The list of quizlet vocabulary terms can be found here. 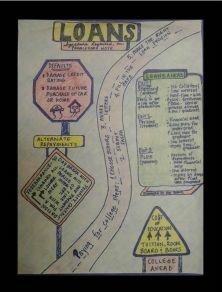 After going over the vocabulary terms and demonstrating Quizlet, I give students the article “The Lowdown on Loans” along with the guide sheet. The objective of this assignment is to individually create a thematic graphic organizer for the information within the provided article. The graphic organizer should be a creative visual display of the reading. The organizer should be neat, easy to read and show the connections among ideas. 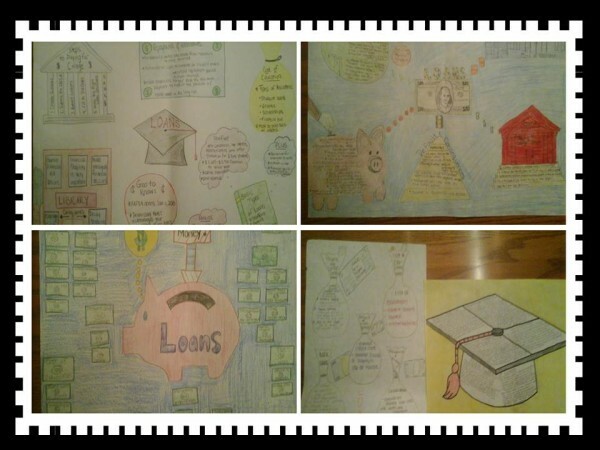 Students are also informed that the more information they supply, the better the graphic organizer will be. They should be specific and provide details as they will be able to use their graphic organizer during the quiz of this information. 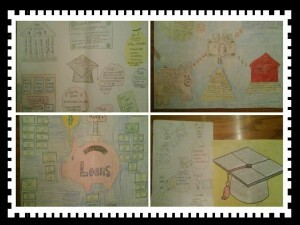 Below are a few examples of thematic graphic organizers created by students.